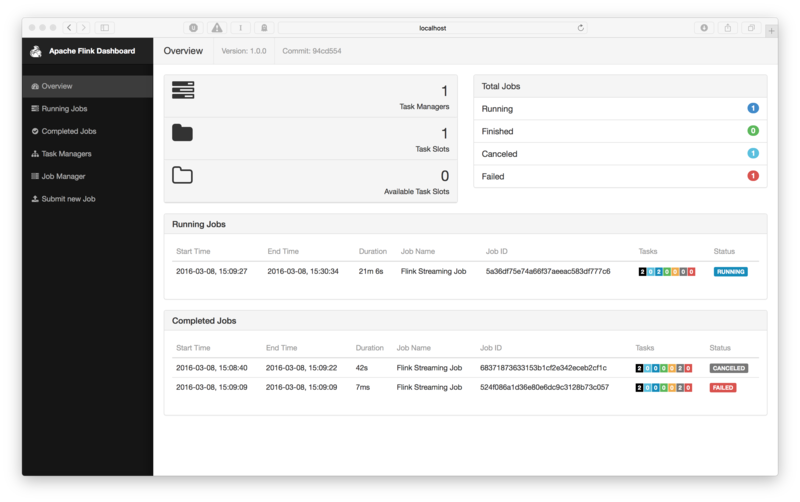 In this guide we will start from scratch and go from setting up a Flink project to running a streaming analysis program on a Flink cluster. Wikipedia provides an IRC channel where all edits to the wiki are logged. We are going to read this channel in Flink and count the number of bytes that each user edits within a given window of time. This is easy enough to implement in a few minutes using Flink, but it will give you a good foundation from which to start building more complex analysis programs on your own. The program is very basic now, but we will fill it in as we go. Note that I’ll not give import statements here since IDEs can add them automatically. At the end of this section I’ll show the complete code with import statements if you simply want to skip ahead and enter that in your editor. The first call, .timeWindow(), specifies that we want to have tumbling (non-overlapping) windows of five seconds. The second call specifies a Fold transformation on each window slice for each unique key. In our case we start from an initial value of ("", 0L) and add to it the byte difference of every edit in that time window for a user. The resulting Stream now contains a Tuple2<String, Long> for every user which gets emitted every five seconds. That last call is necessary to start the actual Flink job. All operations, such as creating sources, transformations and sinks only build up a graph of internal operations. Only when execute() is called is this graph of operations thrown on a cluster or executed on your local machine. The number in front of each line tells you on which parallel instance of the print sink the output was produced. This should get you started with writing your own Flink programs. To learn more you can check out our guides about basic concepts and the DataStream API. Stick around for the bonus exercise if you want to learn about setting up a Flink cluster on your own machine and writing results to Kafka. 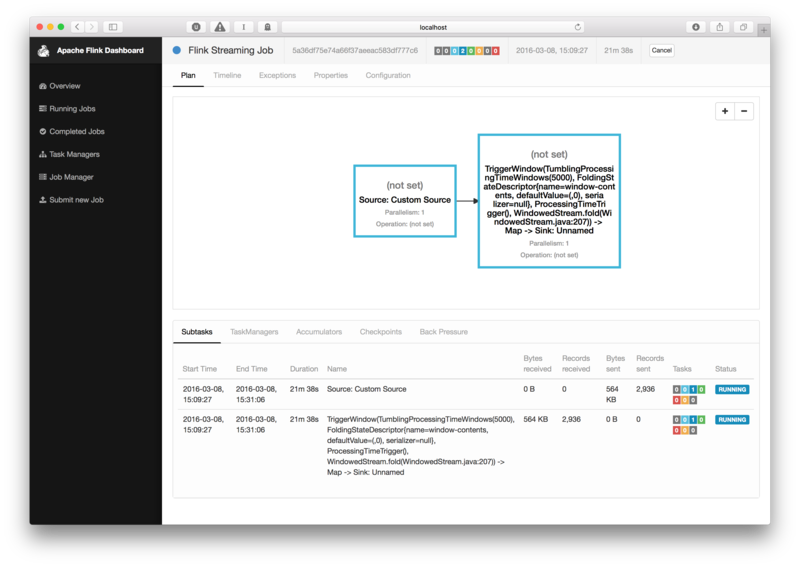 Please follow our setup quickstart for setting up a Flink distribution on your machine and refer to the Kafka quickstart for setting up a Kafka installation before we proceed. The resulting jar file will be in the target subfolder: target/wiki-edits-0.1.jar. We’ll use this later. 03/08/2016 15:09:27 Job execution switched to status RUNNING. You can see how the individual operators start running. There are only two, because the operations after the window get folded into one operation for performance reasons. In Flink we call this chaining. This concludes our little tour of Flink. If you have any questions, please don’t hesitate to ask on our Mailing Lists.